Thanks to everyone who has sent me messages enquiring how I am doing with all the flooding in Brisbane. I even got messages from people I do not think I have ever had any direct interaction with… As long as your stalking sticks to that level, I will remain only slightly concerned! 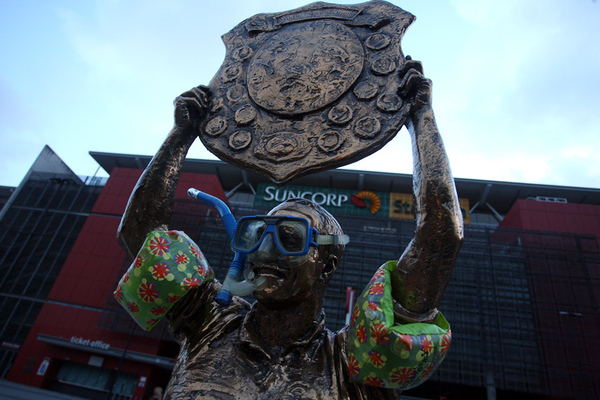 In typical Brisbane fashion, even the statue of King Wally (a local living sporting legend) was prepared for the flooding. And the man himself proved he was worth it; stopping to help complete strangers bail water out of a house today. I think one of the heroes of the day is the person who paddled a canoe down the main streets of the city centre handing out cold beers to the people doing sandbagging. That is the sort of city Brisbane is.